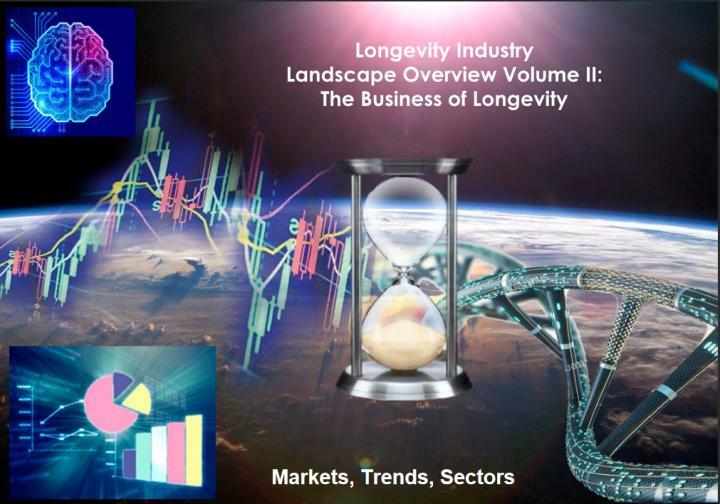 Wednesday, May 2, 2018, London, United Kingdom: The Global Longevity Consortium, consisting of the Biogerontology Research Foundation, Deep Knowledge Life Sciences, Aging Analytics Agency and Longevity.International platform, announce the publication of a new 650-page analytical report entitled Longevity Industry Landscape Overview Volume II: The Business of Longevity. This new report, standing at 650 pages, gives a more comprehensive look at the major players, companies, investors and influencers that comprising the emerging longevity industry globally. It categorizes, systematizes and individually profiles what we consider to be the top 100 longevity companies and VC firms, as well as the most prominent individual longevity investors and thought leaders. It offers a history of the longevity industry, its rise in 2016 and it's full-blown emergence in 2017, forecasting the major trends and developments in the industry in the years to come, as well as discussing in detail what the major risks and roadblocks are moving forward, and the major items that stand to jeopardize the credibility and success of the industry. This report details the present state of personalised, precision, and preventive medicine (referred to hereafter as "P3" medicine), how it works in conjunction with emerging preventative medical technologies, and the prospects for the next five years. Interested readers can view the full report online, or can view the report's Infographic Summary to get a brief but comprehensive overview of its contents. It follows on the heels of Volume I: The Science of Longevity, which set the landscape of geroscience against the backdrop of the 'silver tsunami' of global demographic aging. It summarised the history and current state of development in geroscience, and examined whether existing proposed solutions measure up to the impending problems. This first report tied together the progress threads of the constituent industries into a coherent narrative, mapping the intersection of biomedical gerontology, regenerative medicine, precision medicine, artificial intelligence, offering a brief history and snapshot of each. It also categorized, systematized and individually profiled 650 longevity-focused entities, including research hubs, non-profit organizations, leading scientists, conferences, databases, books and journals. This second volume outlines the commercial side of this emerging industry. It describes the novel financial systems that will form the necessary framework of the industry. Mindful of the large size and complexity of the industry, the report utilizes comprehensive infographics and specialised mind maps in order to do for longevity what Mendeleev, with his Periodic Table of Elements, did for chemistry, so that specialists and non-specialists alike could stand united before a unified vision of the industry landscape. Notably, the report classifies different sectors in the industry and considers the synergetic convergence of several sectors that are not traditionally seen as related to the Longevity industry. In particular, in addition to biomedicine proper, the report classifies the emerging technologies of P3 Medicine, as well as the AgeTech sector (consisting of non-biomedical technologies that can assist elderly people in maintaining quality of life), and the financial sphere as four intersectional quadrants of the Longevity industry. Rather than being seen as separate industries with fairly little overlap, they should in fact be more appropriately considered in combination and convergence. Given the significant impact that societal ageing and Longevity have upon economies, pension funds and insurance companies in particular, and healthcare systems in general, have the potential to tie financial performance to quantitative measures of healthy longevity like HALY (health-adjusted life years) and QALY (quality-adjusted life years) in order to help economies thrive due to an increase in its citizens healthy longevity. Chapter 7 of the report considers the creation of a novel financial system in relation to longevity, and how a new financial model can be created to simultaneously avoid economic stagnation in the face of demographic aging, while creating an infrastructure whereby governments and financial institutions can reap gains from maximizing not just population lifespan, but healthspan as well. Much in line with the release of Volume I, the Global Longevity Consortium has published Volume II: The Business of Longevity online, freely available to the public, in order to promote a more comprehensive understanding of the emerging longevity industry for scientists, investors, entrepreneurs, investors, analysts and enthusiasts alike. It will be followed-up by several special case studies throughout 2018, including regional case studies that analyze the longevity industry in specific geographic locations (the first of which will be Longevity Industry in the United Kingdom), as well as several other case studies which give deeper analysis to some of the specific topics introduced in Volume II.